Home-grown property developer Emaar is the most recommended brand among consumers in the UAE according to the latest brand rankings from YouGov BrandIndex. Having developed some of the country’s most iconic entertainment attractions, hot spots, hotels, malls and residential and commercial communities, Emaar has produced consumer experiences that have helped to shape the UAE’s popularity as one of the leading destinations of the world. The rankings demonstrate in the past 12 months the Emaar experience has made the biggest lasting impression on consumers, enough to make them endorse their brand the most to others. 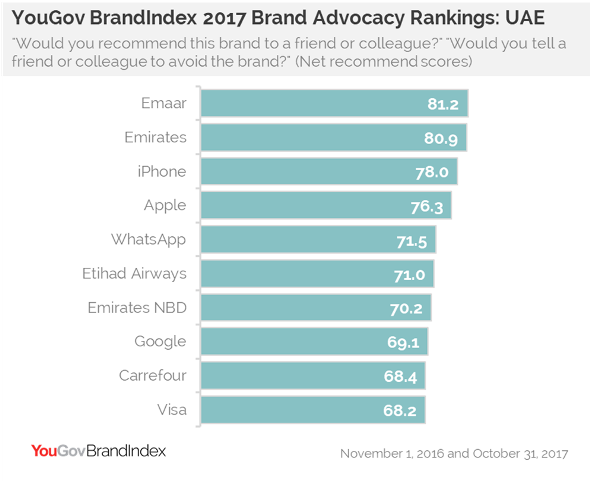 Behind Emaar, the UAE’s top 10 most recommended brands include three other home-grown brands with national airlines Emirates, following closely in second place, and Etihad Airways in sixth, while Emirates NBD comes in seventh. iPhone and Apple score highly in third and fourth place respectively, leading the most endorsed tech and mobile brands and unchallenged by their competitors in the top 10. Meanwhile WhatsApp sits in fifth and Google in eighth, proving the worthiest of advocacy among social messaging and search brands in the Emirates. 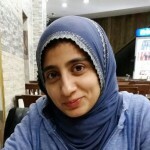 Rounding out the 2017 Advocacy Rankings are leading multinational retailer Carrefour, franchised by Majid Al Futtaim, in ninth place, followed by financial services and global payments technology leader Visa, in tenth.